ItemsSource, of type IEnumerable, specifies the collection of items to be displayed, and has a default value of null. ItemTemplate, of type DataTemplate, specifies the template to apply to each item in the collection of items to be displayed. Note that the x:Array element requires a Type attribute indicating the type of the items in the array. If the CollectionView is required to refresh as items are added, removed, or changed in the underlying collection, the underlying collection should be an IEnumerable collection that sends property change notifications, such as ObservableCollection. For information on how to change the CollectionView layout, see Specify a Layout. For information on how to define the appearance of each item in the CollectionView, see Define item appearance. In this example, the ItemsSource property data binds to the Monkeys property of the connected view model. Compiled bindings can be enabled to improve data binding performance in Xamarin.Forms applications. For more information, see Compiled Bindings. 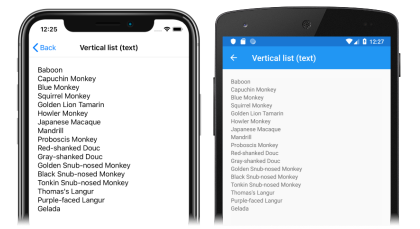 For more information about data binding, see Xamarin.Forms Data Binding. 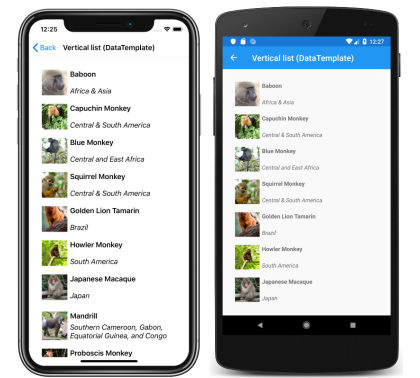 For more information about data templates, see Xamarin.Forms Data Templates.